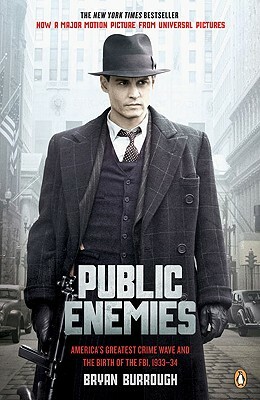 "ludicrously entertaining" ("Time"), " Public Enemies" is the story of the most spectacular crime wave in American history, the two-year battle between the young J. Edgar Hoover and his FBI, and an assortment of criminals who became national icons: John Dillinger, Machine Gun Kelly, Bonnie and Clyde, Baby Face Nelson, Pretty Boy Floyd, and the Barkers. In an epic feat of storytelling, Burrough reveals a web of interconnections within the vast American underworld and demonstrates how Hoover's G-men secured the FBI's rise to power.
" [A] riveting true-crime tale . . . fascinating . . . the real story, it turns out, is much better than the Hollywood version." "A rollicking yarn whose prose bounces across the page like a getaway car through a wheat field." "An amazingly detailed true-life thriller that puts us on a stakeout alongside the feds, inside the banks while bullets fly, and inevitably, next to the criminals' bloody corpses."